There really is nothing like giving – and receiving – something homemade. Forget trawling around the shops with a list as long as your arm, online shopping into the wee hours and quietly panicking that someone unexpected will give you a gift – just keep a batch of cookie dough in the freezer. You never know when it might come in handy. It’s certainly going to be my plan anyway. After once again signing up for the food blogger equivalent of Secret Santa, I whipped up a batch of these very Christmassy cookies and thankfully they seem to have been a hit. So much so that the surplus dough magically found its way into my mother’s freezer. I think I might need to make more. This is the second year that I have taken part in The Great Food Blogger Cookie Swap and it never fails to amaze me how creative we can all be with a brief of just a dozen cookies. In two years I have never received anything remotely similar, with my 2013 boxes from Come Con Ella, Pat’s Kitchen and Quips and Dip no different. I am not a big fan of Bailey’s, but Emma’s Choconut Cookies were far too delicious for their own good, Patrice’s Crunchy Frostbite Cookies were gladly received by the other half’s work mates and I have to admit, I ate all of Mehrunnisa’s Roll Out Brownie Cookies in the space of 24 hours. Too dang good. This year I wanted my own contribution to stick with the festive theme following my Snowflake Lebkuchen from last year, and so I looked to everyone’s favourite Christmas tipple Brandy as my inspiration. I love soaking dried cranberries in liquid; it transforms these little fruits into bursting jewels of both colour and flavour and gives the whole cookie a real festive theme. To add a little outrageousness, I stirred through some completely unnecessary but totally beautiful toasted pecans that I sprayed with edible gold for a little opulence. 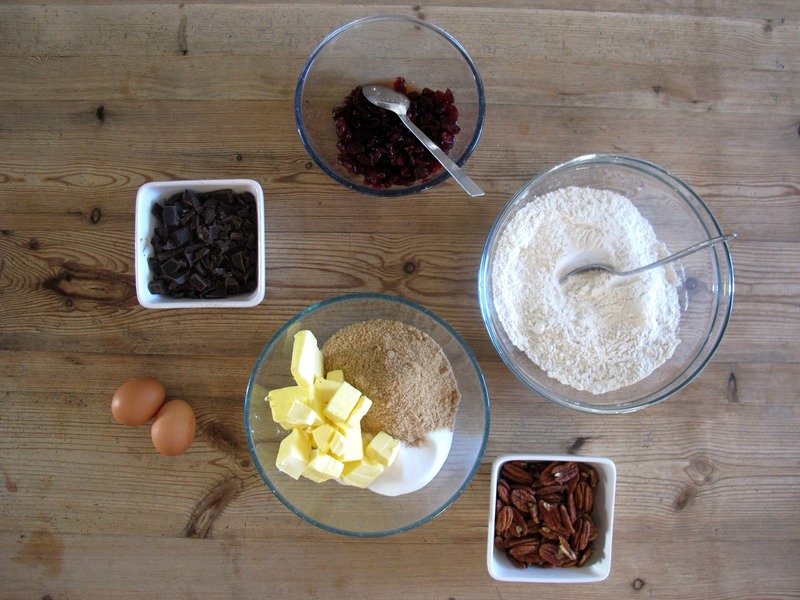 And finally, because every good cookie needs a little chocolate, I added dark and seductive 71% chunks to the dough. There may seem a few steps to undertake with this recipe, but I love that it can completed in stages, which is perfect for festive gift giving when you only have an hour or so here and there. 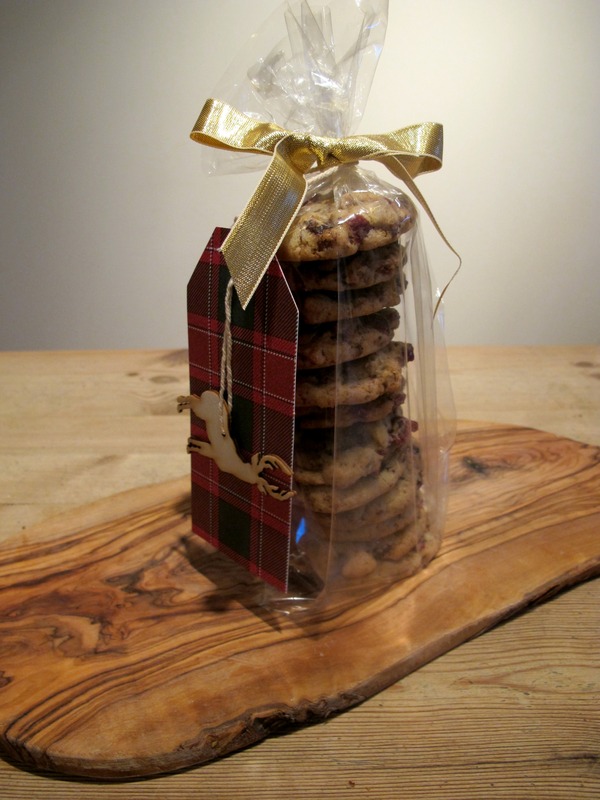 I stacked my cookies in clear treat bags and sealed with plastic ties before wrapping around gold ribbon and finishing with a tartan gift tag. These would make perfect gifts for colleagues either wrapped or as a free-for-all in the tea room. Either way, people will really appreciate the effort you have gone to in order to make these festive treats – certainly better than a pair of socks anyway. There are a few notes to be made with this recipe; it yields around four or five dozen cookies (I lost count to be honest) but it can be halved easily if you are looking to make less. The low temperature is purposeful – I’ve tried baking this recipe at higher temperature and it sort of boils from the inside so take care. And obviously if you aren’t much of a drinker, you may want to substitute the brandy for fresh clementine juice which will still give these cookies that festive flourish. Either way, I do hope you give them a try. Tis the season to spread love with a dozen cookies and all that. 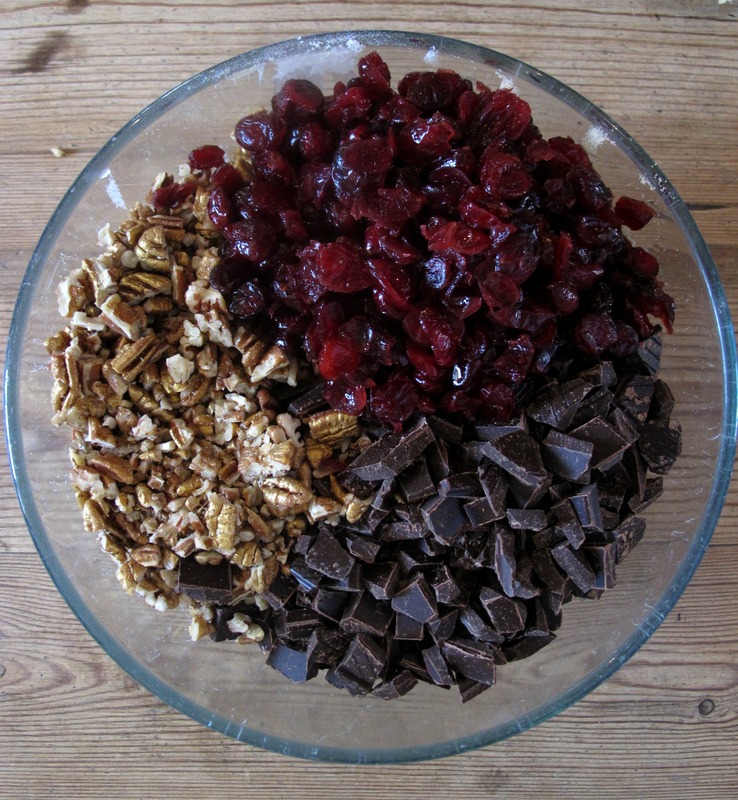 To get ahead, place the dried cranberries in a bowl and cover with the brandy or Clementine juice if using. Set aside to macerate for as long as possible so the berries can soak up the liquid – I did this for two hours but overnight is best. 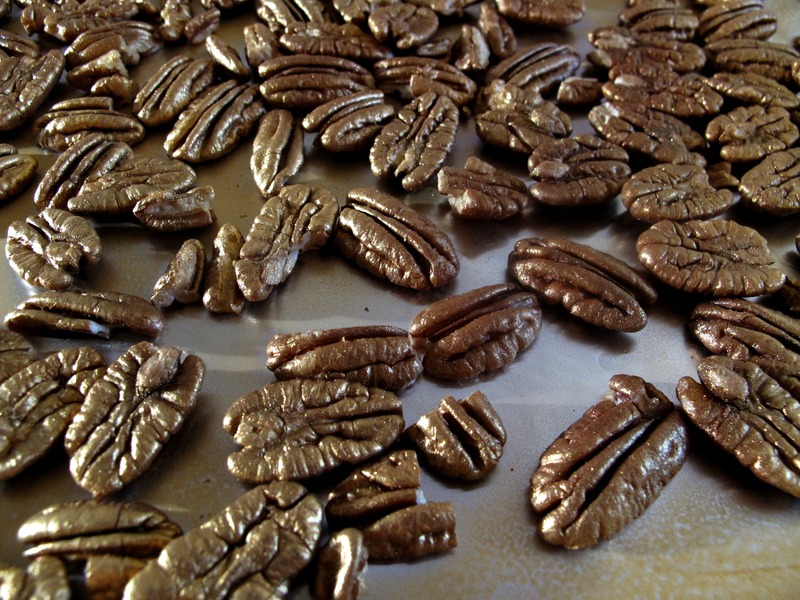 To prepare the golden toasted pecans, preheat the oven to 150oc/130oc fan and line a baking sheet with parchment. 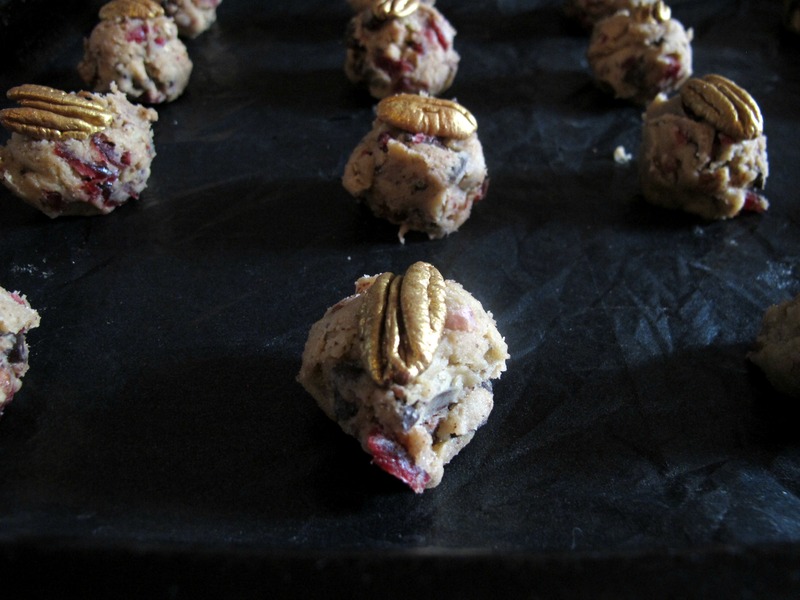 Scatter the pecans in one layer and bake in the oven until nutty and fragrant, which will take around five minutes. Remove from the oven and leave to cool. 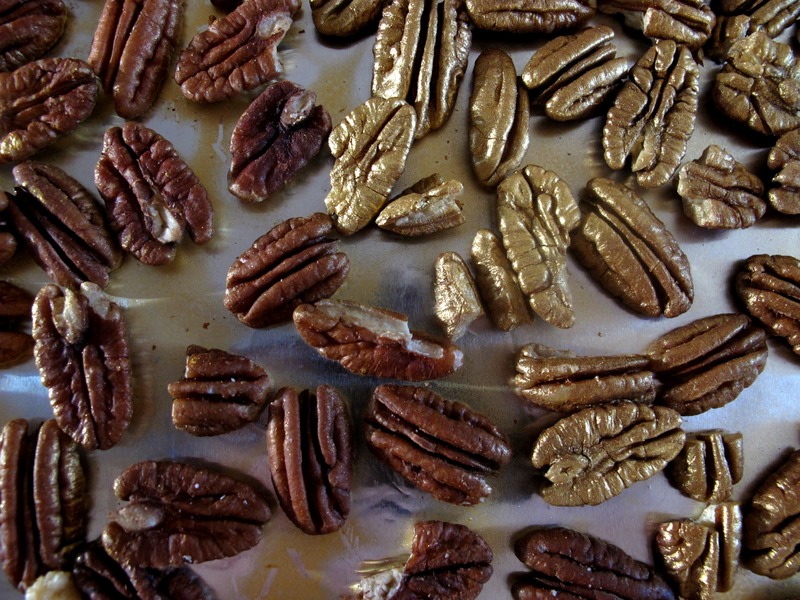 Once cool, shake the lustre spray and spray evenly across each pecan to give it a golden sheen. Leave to dry then turn each pecan and spray the other side. 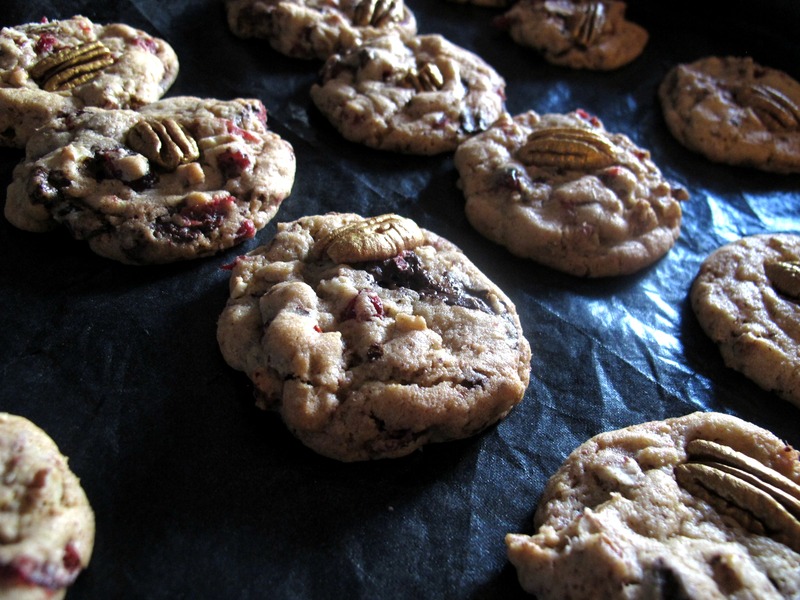 Once both sides are dry, chop half the pecans and leave the rest whole – these will be pressed into the tops of some of the cookies for a pretty finish. To make the dough, place the softened butter and sugars in the bowl of a stand mixer and beat for around 5 minutes until creamy. At first it will all come together like a biscuit dough but persevere, it will smooth out. Lightly beat the eggs and pour into the sugar mixture a bit at a time. Stop the mixer and scrape down before mixing again briefly with the vanilla paste. 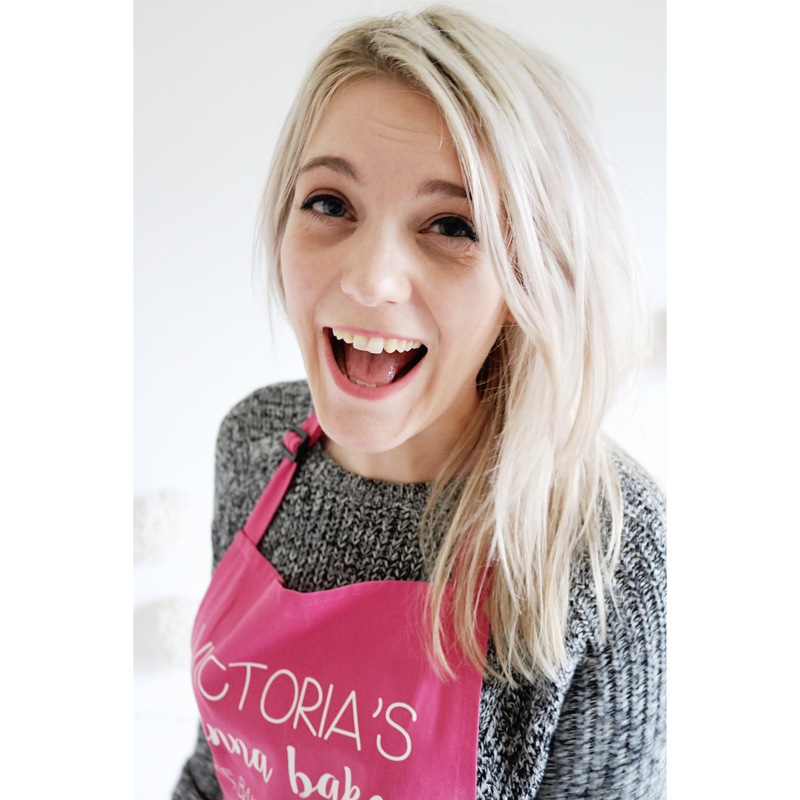 Whisk the flour, bicarbonate of soda and salt together then tip into the sugar mix all at once and mix on low until just combined. 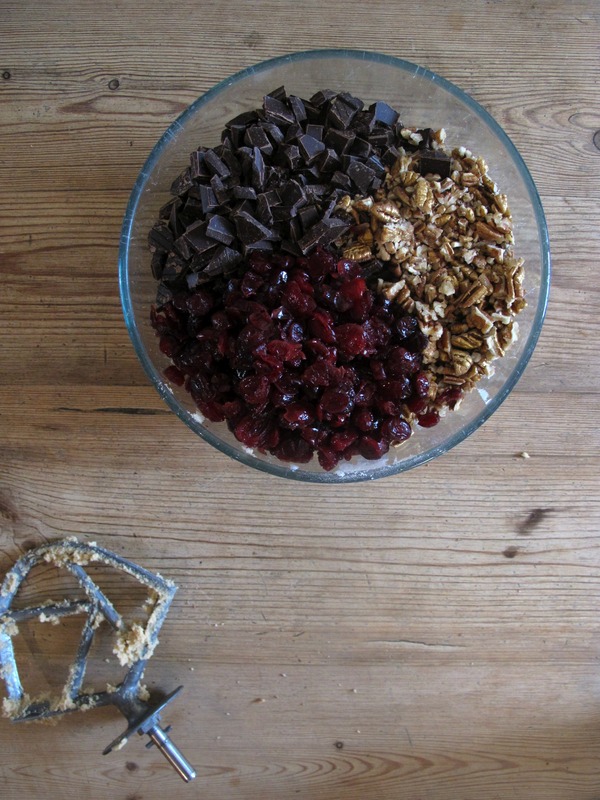 Add the chopped pecans, soaked cranberries and chocolate to the bowl then slowly combine. Cover the bowl with clingfilm and refrigerate for at least two hours, but again, overnight is always preferable with cookie dough. To bake, preheat the oven to 150oc/130oc fan and line two baking sheets with baking parchment. Remove the cookie dough from the fridge and scoop tablespoons of dough onto the prepared sheets spaced well apart. 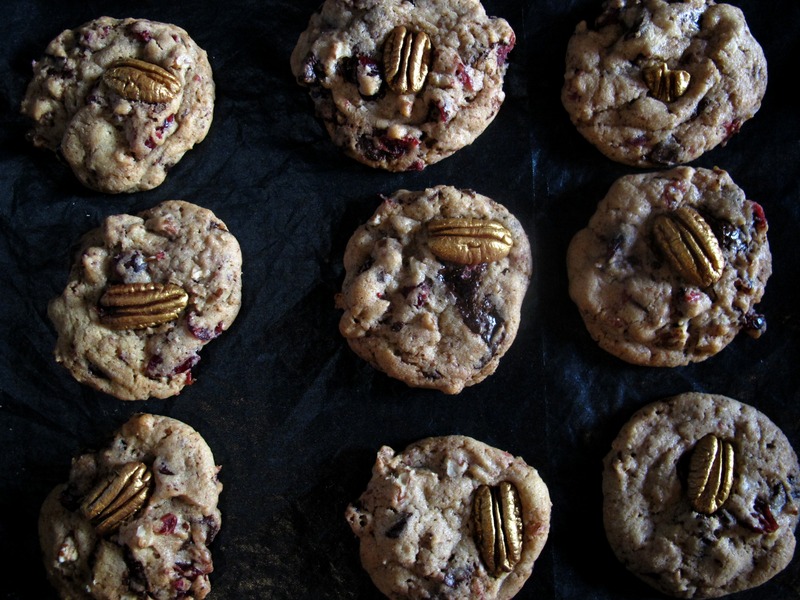 Press a golden pecan on the tops of some of the cookies then bake for around 15-18 minutes until golden but not too crisp. Remove from the oven and leave to cool for a few moments before placing on a wire rack to cool completely. Repeat with the remaining cookie dough until it is all used up. Wow! I’ve never heard of this spray!!!!! Beautiful cookies. Thank you! It gives such a pretty effect and is so easy!